Prep: Wash and dry all produce. In a medium pot, bring 11/3 cups salted water (double for 4 people) to a boil. Cut the tomatoes into 1/2-inch wedges. Roughly chop the cilantro. Zest, then juice the lime(s). 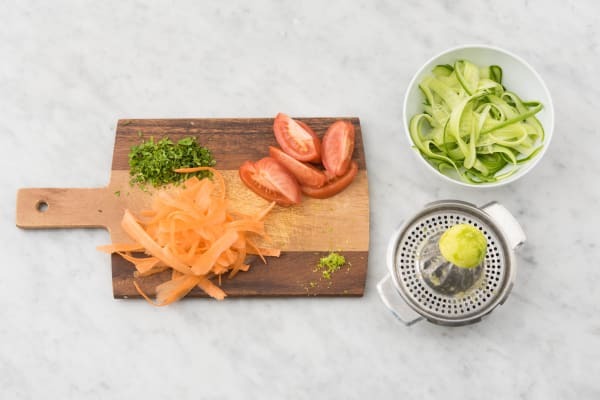 Peel the carrot(s) and cucumber(s) into ribbons. Cook the rice: Add the rice to the boiling water. Reduce the heat to medium-low. Cover with a lid, and cook until the rice is tender and the water has been absorbed, 12-14 min. 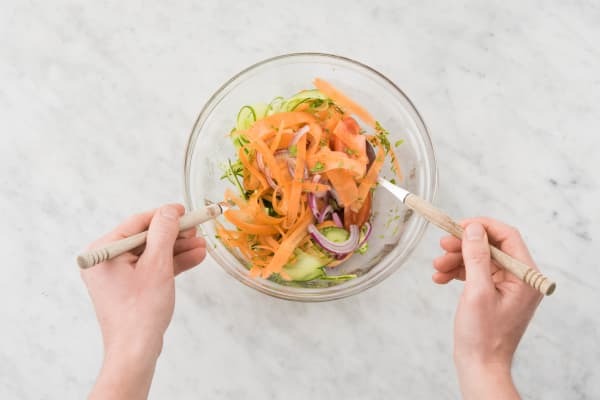 Make the dressing: Meanwhile, in a large bowl, whisk the brown sugar, fish sauce, lime juice, lime zest and as much chili-garlic sauce as you like. Add the onion, tomatoes, veggie ribbons and cilantro. Set aside. Sear the beef strips: Heat a large non-stick pan over high heat. Add a drizzle of oil, then half the beef strips. Cook until browned, 1-2 min per side. Transfer to a plate. Repeat with the remaining beef. 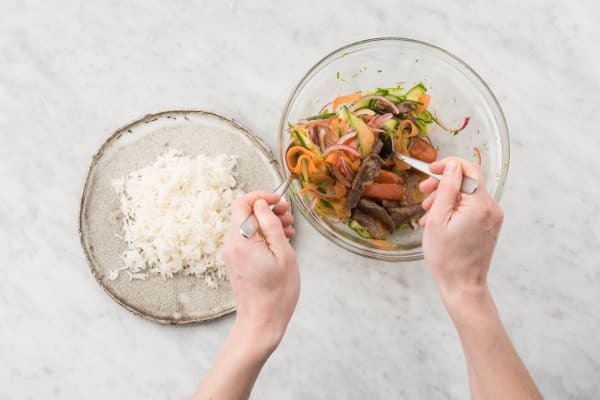 Finish and serve: Add the beef to the salad. Toss to combine. 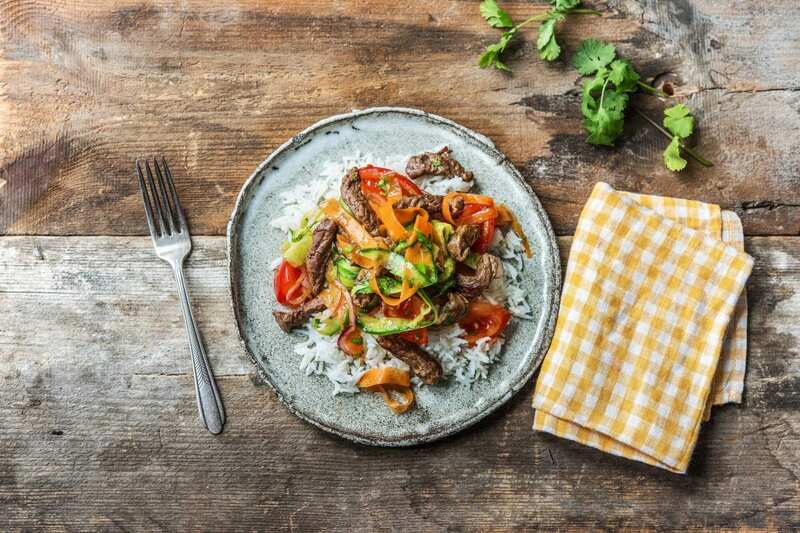 Divide the rice between plates and top with the Thai beef salad. Enjoy! COOKING TECHNIQUE: To 'sear' means to cook meat quickly at a high temperature until a brown crust forms on the surface. This browning gives your beef lots of flavour! 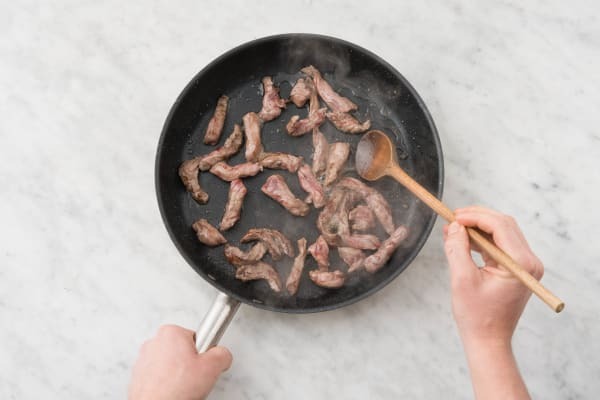 We recommend cooking beef strips in batches because crowding the pan can cause the meat to steam instead of sear, and you won't get that hearty flavour!